Cinnamon is one of my favorite flavors, so it’s no surprise that there are numerous Monday Box recipes that feature cinnamon. A Monday Box recipe search will show cinnamon bread, cinnamon cake, cinnamon cookies, twists, snowballs, and now Cinnamon Snap Cookies. There is something about the sweet-spicy flavor of cinnamon that makes all kinds of baked goods taste better. The kitchen smells amazing as they bake, too! I was immediately hooked when I first saw this Cinnamon Snap Cookie recipe on the Instagram feed for Imperial Sugar, a regional brand of sugar found mostly in the southern United States. The recipe can be found on Imperial’s web site too. The recipe was originally published in 1940 by Imperial Sugar in a booklet called, “Aunt Cora’s Book of Unusual Cake and Cookies.” I think the most “unusual” thing is the name of the booklet! The cookie itself isn’t “unusual”, but maybe it was in 1940. 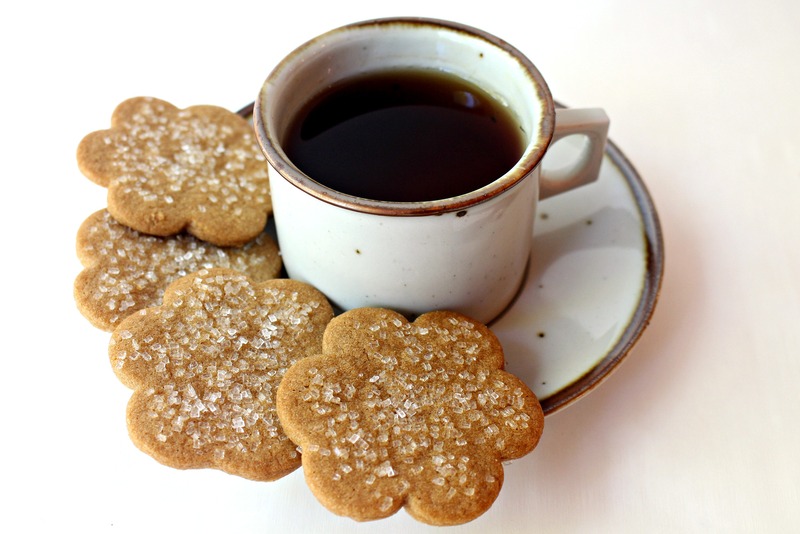 The “unusual” aspect of this recipe may be the way both the brown sugar and the baking soda are dissolved in liquid before being added to the other ingredients. I am not sure of the chemical impact this has on the final product. 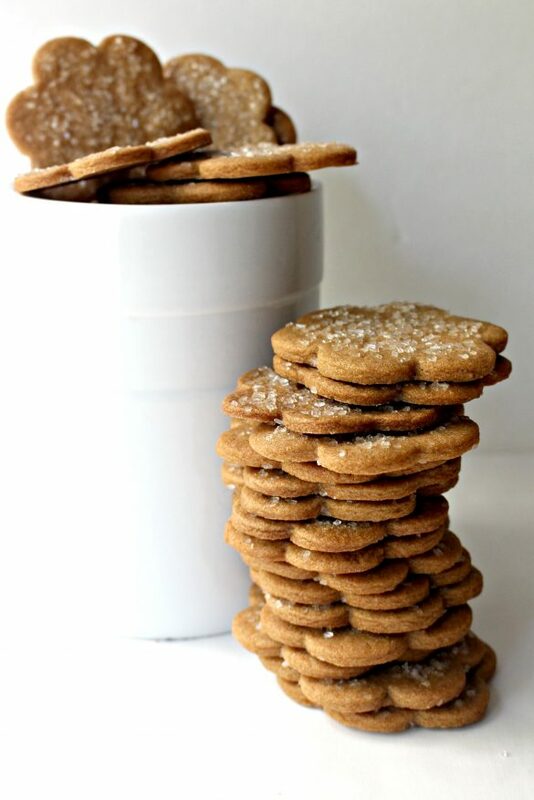 Perhaps it adds to the crispness, which produces a real “snap” when the cookie is broken in half, making Cinnamon Snap Cookies a great cookie for dipping and dunking. 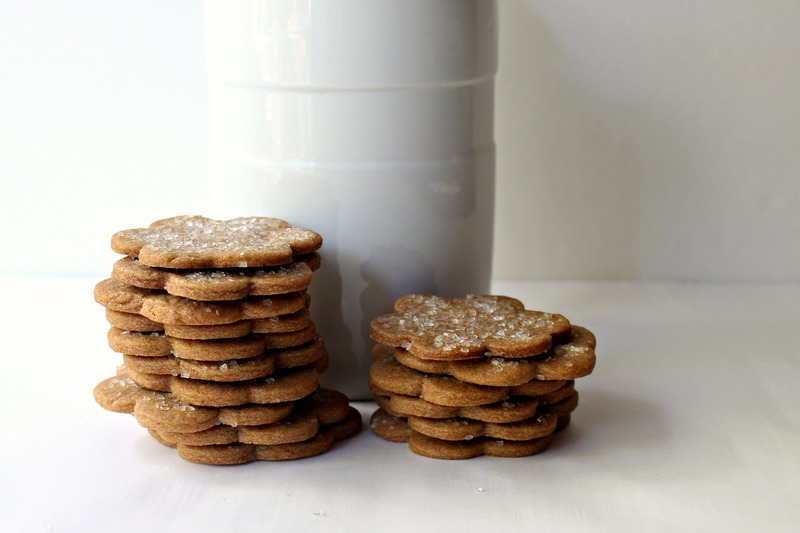 Cinnamon Snap Cookies are a cookie jar staple and a care package favorite. When kept in an airtight container, this crunchy cookie stays crisp and delicious for at least 2 weeks, and are sure to add a spicy snap to anyone’s day. In a small mixing bowl, microwave 3 tablespoon of water until very hot. Add brown sugar and stir until dissolved. Set aside to cool to lukewarm. In the bowl of an electric mixer, cream shortening and granulated sugar. Beat in brown sugar syrup and dissolved baking soda. In a large mixing bowl, whisk together flour, cinnamon, ginger, and salt. Gradually, dry ingredients into creamed mixture to form a stiff dough. If dough is crumbly, rather than a solid ball, continue mixing and add up to 2 tablespoons of water until a dough ball forms. Wrap dough in plastic wrap and refrigerate for 2 hours-overnight. When ready to bake, preheat oven to 375° F and line a baking sheet with parchment paper. Roll the dough thin, about 1/8”, between two sheets of parchment paper. 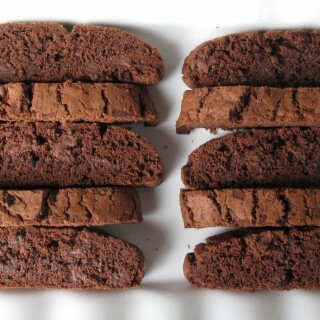 Slice into rectangles or cut into shapes with cookie cutters. Place the cookies 1/2” apart on the prepared cookie sheet. Sprinkle with decorating sugar and gently press the sugar into the dough. Bake for 8-10 minutes until uniformly golden brown. Cool on the baking sheet for 3-5 minutes then transfer to wire racks to cool completely. Store at room temperature in an airtight container for at least two weeks. If the cookies are exposed to humidity they will soften. To keep the cookies crisp, they must be stored as airtight as possible. Wrap small stacks of 2-4 cookies in plastic wrap. Place columns of cookie stacks in freezer weight ziplock bags or plastic storage containers removing as much air as possible before sealing. Looking for more crunch? 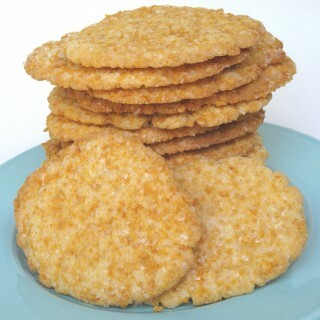 Try these popular cookies! These look wonderful Wendy. 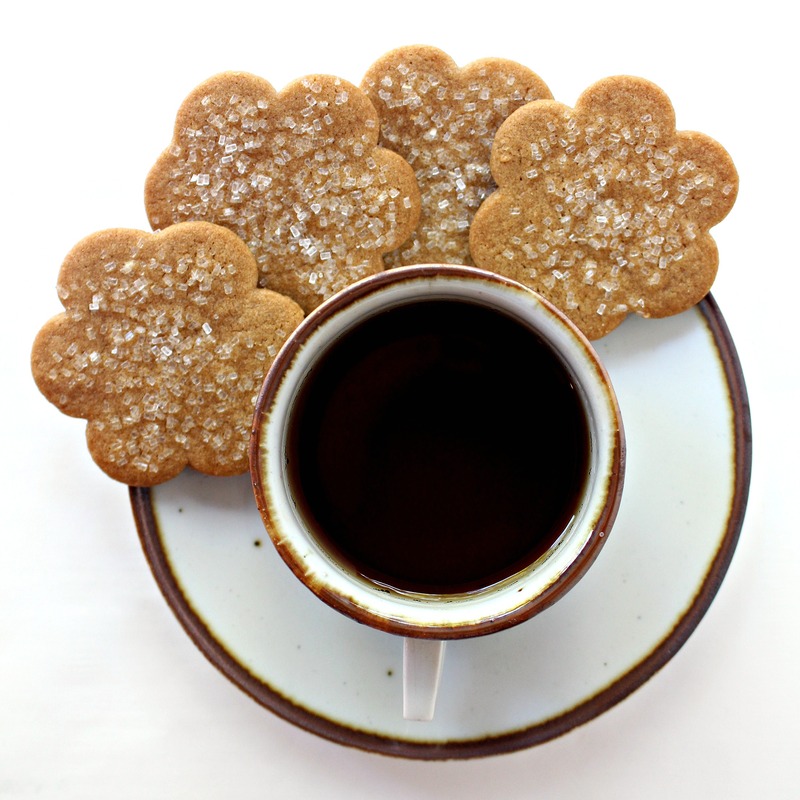 I adore a crisp, autumn spiced cookie, I will definitely be trying them! Cinnamon is also a favorite of mine. Looking forward to trying these! I’m with you – I am a sucker for just about anything with cinnamon! These snaps look fantastic! Perfect for with coffee or a steaming mug of tea! Thanks, Ashley! A crunchy cinnamon cookie and tea sounds really good to me! 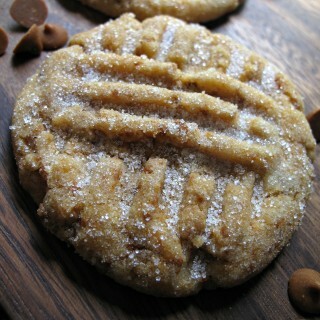 I love a good cinnamon cookie and this one looks perfect. Crisp and sweet on top and so pretty too! Another amazing cookie recipe! I’d much rather eat your cookies than the Imperial ones! Yours are so much prettier and more delicious looking! I like the crunchy sugar on top like snowflakes. I would dip and dunk my little heart out. 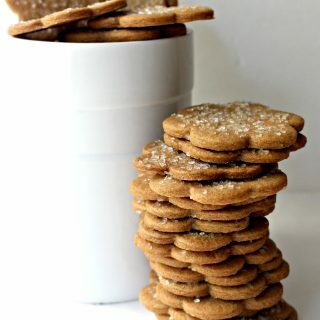 Your Cinnamon Snap Cookies look wonderful, sure wish I had one right now! Thanks so much for sharing with us at Full Plate Thursday. Have a great weekend and come back soon! What a great cookie, Wendy! I know I’d love them! Thanks for sharing with us at Throwback Thursday! Thanks for hosting Throwback Thursday, Mollie! I’m glad you like these Cinnamon Snaps! They look gorgeous, I’m so glad Autumn is here! Thanks, Kat! I’m glad about Autumn, but am always aware that Autumn means winter is around the corner! Thank you for sharing this recipe on the Simply Sweet Home Linky Party. You were my choice for this week’s feature. Be sure to go by the blog and grab your I’ve been featured button. Thoughts on making the dough ahead of time and freezing? Hi, Daliana! I think you could absolutely make this ahead and freeze the dough. However, I wouldn’t freeze it immediately. The recipe calls for letting the dough chill 2-hours-overnight. I would freeze the dough after it chills (perhaps the next day) to ensure that the flavors and texture have had time to do their chemistry magic. 🙂 Happy baking! Just finished baking them (after leaving them on the fridge overnight). They were delicious! I love that they are crunchy! I’m sure I’ll be making them again. Thank you! So glad you are enjoying them, Daliana! I appreciate your coming back to tell me and leaving the 5 star review. 🙂 Thank you!